African-American hair is different from hair of other ethnicities because it requires an extensive styling process after it's gotten wet. 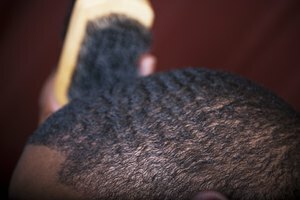 For this reason, many African-Americans opt to either cover their hair or put it in a certain hairstyle if they know they are going to get it wet. This is particularly important for those who swim frequently because the constant styling after swimming can weaken the hair follicles. These styles hold up well during swimming and other water-based activities and are aesthetically pleasing. This style is great for those looking to take a quick dip and don't plan to do a lot of splashing or underwater swimming. A simple bun not only prevents hair from getting wet, but also makes it easy to brush back down and re-style. Brush your hair into a ponytail on the top of your head and wind it around in a bun. Use bobby pins to hold it in place and a headband to catch and hold any stray pieces. This works best for women with medium to long hair. Cornrows are a solid hairstyle option for African-Americans who swim often and underwater. They not only stay in place well, but can also be worn for several days at a time. The easiest way to get this style is to part the hair into four or five large pieces. Then, starting at the front, braid back and down, pulling in pieces along each larger section as you go. Try to keep the parts even so it looks neat and fasten the ends with a small rubber band or ponytail holder. You can wash your hair after swimming and this particular style will hold well. If you want to preserve a flat-ironed style, it's best to wrap the hair when wet and tuck it into a swimming cap. This not only prevents the hair from getting wet, but it allows you to easily brush it down when you are done swimming. To wrap it, start with sopping wet hair and brush it around your head in a clockwise motion. Start at the middle of the scalp while doing it and brush it in a circle until all of the hair is laying down flat in a circular shape. Spray on some wrap spray or slick it down further with wrapping lotion to hold it in place. Place the swimming cap on to continue to hold it in place until you are done swimming.